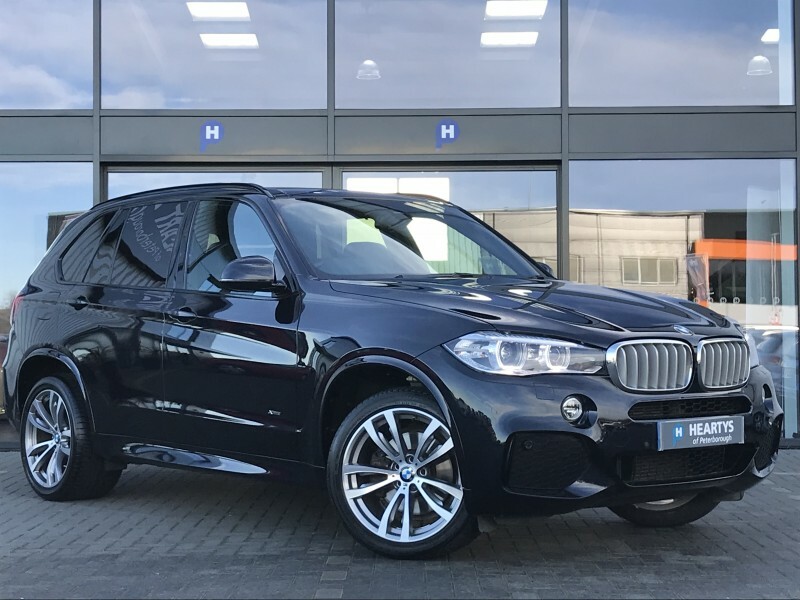 BUY THIS EXTREMELY HIGH SPECIFICATION 2016/66 BMW X5 XDRIVE 40E M-SPORT HYBRID 5 DOOR FINISHED IN CARBON BLACK WITH FULL HEATED AND ELECTRIC MEMORY BLACK LEATHER SEATING. 20"M DOUBLE SPOKE ALLOY WHEELS WITH REAR PRIVACY GLASS. FULL BMW MAIN DEALER SERVICE HISTORY WITH 3 X SERVICES AND JUST BEEN SERVICED @ 40,395 MILES. VERY ECONOMICAL AND £0 ROAD TAX. GREAT SPEC INC - REAR ENTERTAINMENT SYSTEM WITH 2 X SCREENS GLASS PANORAMIC SUN ROOF, HARMON KARDON SOUND UPGRADE, HEADS UP DISPLAY, PROFESSIONAL SATELLITE NAVIGATION, REAR CAMERA, ELECTRIC TAIL GATE. HEARTYS OF PETERBOROUGH, A FAMILY RUN BUSINESS BASED IN PETERBOROUGH ESTABLISHED IN 1968, WITH ALL OF OUR CARS HPI CLEAR, AND INDIVIDUALLY SOURCED, WITH SERVICE HISTORY, AND FANTASTIC FEATURES SUCH AS... (FULL BMW SERVICE HISTORY WITH 3 X STAMPS IN THE BOOK, LAST SERVICED ON THE 30/8/18 @ 40,395 MILES) FLEXIBLE FINANCE DEALS AVAILABLE - ....GREAT PART EXCHANGE DEALS AVAILABLE.....CALL NOW FOR DETAILS... ALL CARS COME WITH A COMPREHENSIVE 3 MONTH WARRANTY - VISIT OUR WEBSITE FOR OVER 250 VEHICLES IN STOCK - www.heartysofpeterborough.co.uk NO ADMIN FEES!! BMW X5 xDrive40e M Sport 2L 5dr.